How to Optimize UX of Website with Information Architecture? How to Optimize UX of Website with Information Architecture? How to Optimize UX of Website with Information Architecture? Building a successful website requires much more than mere coding and graphics. A well-structured information architecture that leads to optimal user experience is quintessential to creating an interactive and user-friendly website. Information Architecture is the art and science of organizing, labelling and structuring content of website such that it supports usability and offers good user experience. Web application development company researches on browsing behaviour of users and accordingly organizes the content and flow of a website. What is the Purpose of Information Architecture? Have I come to the right website? Can they offer me something better than others? Assure visitors that they have come to the right place. Give a glimpse of what your company is into at the very first glance of users onto the website. Present users with the information they are looking for through clear navigation and easy search. Highlight the USP of your product or service to make a good first impression in the minds of users. Give users an easy access to CTA button from any page of the website. How Does Information Architecture Help in Improving User Experience? Information architecture is at the foundation of website’s user experience. Well planned, structured and labelled information architecture helps visitors find what they need. It also enables businesses to take the necessary action that helps to achieve their business objectives. Only if users can find what they need, they can buy anything from you. 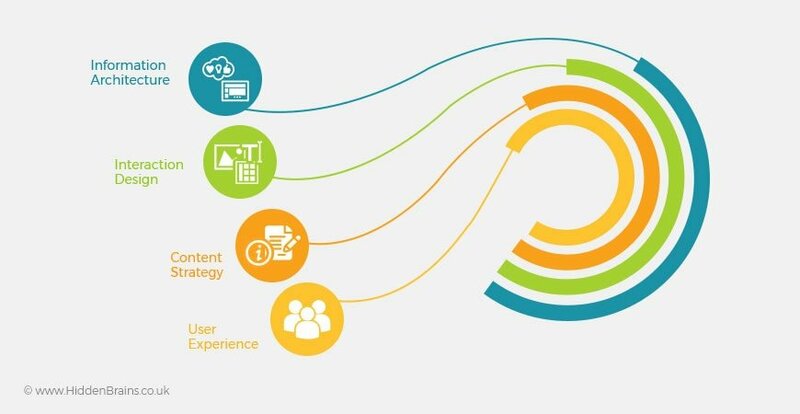 User experience coming from good information architecture is directly connected to high conversion rate. IA allows in organizing the content, images and other media in the way that sells. Create an effective and user-friendly website by communicating with top web designers and developers to build an informed information architecture that delivers optimum user experience. Experts think of Information Architecture as a part of user experience design that contributes to make the content on the website usable and understandable for visitors. Usability: Is the information structured in a format that is easily consumable by the target audience? Accessibility: Is important information and CTA easily accessible and consistent across all web pages? Searchable: Does the website offer easy search option? Is it possible for users to get the required information with relevant keywords? Credibility: Is the information displayed on the website convincing enough for the users of its purpose and usability? Transparency: Is the content understandable by users in the first interaction? Interactivity: Is the flow of content engaging for users to indulge in an interaction with the website? Uniqueness: Is the structure and placement of content and media on website unique? Does it attract users because of its uniqueness? What’s the Difference between IA and UX? The terms ‘User Experience’ and ‘Information Architecture’ are definitely related to each other, but they are not one and the same. Information architecture is more like a blueprint of the design structure that is further shaped into wireframes and sitemaps of the website. UX experts use these blueprints as reference for planning navigation system. UX design goes beyond mere content structuring. The main aim of user experience is to account for pleasant interaction model so that users feel extremely comfortable in accessing the website. Talking about the UX of website, it includes various aspects of user’s behaviour and actions; whereas Information Architecture experts design the structure as per user’s goals. Information architecture is the foundation for implementing user-centric approach in design. Interaction, seamless navigation, visual elements and functionality of website are built according to the information architecture principles. As a matter of fact, even compelling content elements and powerful UI/UX design can fail without appropriate IA. 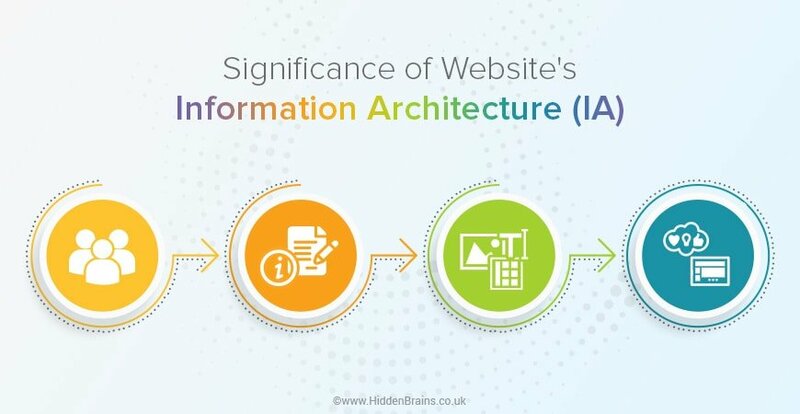 Companies that ignore the significance of information architecture face issues of less interactivity with users, lower engagement rate and reduced website traffic. Though building a systematic IA is a time consuming process, hiring services of a leading web application development company could be a great help! Hidden Brains is a reputed website development company that designs well-thought information architecture to account for excellent user experience. We reduce the possibility of usability and navigation problems by designing flawless information architecture of website. For your website IA and UX needs, contact Hidden Brains professionals now!